Let CKR, Inc. save you time and money. Down time means lost revenue. We understand the importance of minimizing down time and getting you back in business, Fast! CKR will have most of the parts on our service trucks geared towards our specific customers. If we do not have the right part to get you up and running on the first visit, we will not charge you to return! What CKR, Inc. will do for you that others will not! 1)Same day service, Service in hours not days. 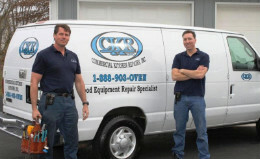 CKR will be there when you need us. 2)Technicians who really know what they are doing, really! A service company is only as good as its technicians! Our techs are highly trained and experienced on Hot side Food Preparation and Dishwashing equipment. 4)Parts on the Service Trucks geared towards our customers. If we do not have the part to do the job the first time out, our company will not charge you to return to your location. This is our promise to you. 5)Approval before any high dollar repairs are made. If we can repair the item for our minimum charge we do. 6)Our office staff is trained on the equipment we service. They understand your needs and resolve your issues quickly. 7) 24 hours a day 7 days a week. We never close. 8) Our rates are the lowest in the area. Compare our charges with other food equipment service companies. You will be impressed! 9) We charge by the ½ Hour not the Hour. This equals big savings to our customers. 10) A satisfaction guarantee if we do not meet your expectations. That’s how confident we are. Let’s see the other companies make that promise! Call us TODAY at 1-888-903-OVEN for more details and to schedule a visit from our technicians. Commercial Kitchen Repairs Owner and VP. "We Will Be There When You Need Us"